Summer is a vacation from school. A time meant to kick back and relax while enjoying the fruits of our hard labor throughout the school year. Yet how many times do we find ourselves feeling as if we have accomplished virtually nothing throughout our time off? This year, my mom decided it would be a good idea if everyone in the family made a list of summer goals. These goals ranged from fun activities, such as “Go for a walk”, to more serious projects, such as “Finish writing my short novel”. No goal is too easy or too hard. 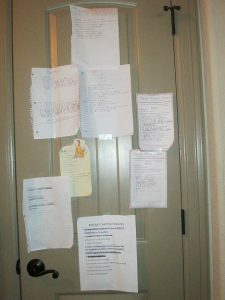 We hung up the lists on a closet door where everyone could see and remember their goals and remind others of their lists. I encourage you to make your own list of summer desires. It helps keep away boredom since the kids already know what they want to accomplish and do. It helps the parents by allowing them to make sure they set aside time for their own activities. One of the goals on my mom’s list is “Set aside time each day to rest and relax”. I’m not sure which parent would not jump at an opportunity like that.